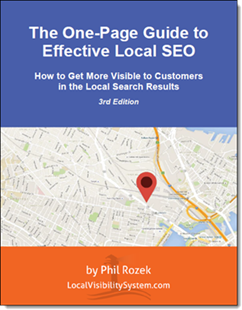 Has your local SEO person nagged you to earn a few good links? I hope so, because that’s good advice. Especially since the Pigeon update, your ability to do RCS and earn links – like from local media and local causes – has become key to ranking well in competitive markets. Maybe your local SEO-er specifically told you to “sponsor a local meetup, like on Meetup.com.” That’s a good thing to do, and a good link. Now get in touch with the organizer(s) and see how you can help. Be sure to read Meetup.com’s guidelines first. Update 12/8/14: Jon Cooper was nice enough to add this tip to his unequaled link-building strategies resource. You’ll want to look at the other strategies in there, and see how they can fit in with the one for Meetup.com sponsorships. By the way, his course is some of the best money you can spend on your local-SEO education. What are your favorite easy local-link-finding techniques? I don’t think we’re talking about the highest quality links here, but definitely decent, and I bet you can get them for a song. P.S. I had a Meetup link for a while. Decent amount of juice. Good share, thanks for taking the time to dial this one up. I actually was really curious on what RCS is, so I’ve spent the last 30 minutes watching Wil Reynolds. RCS is a concept of how I learned to do seo or Internet Marketing in general. For that Phil thanks for the share! Matt, it means you were trained right!!! I have used Meetup for several link opportunities. It is a very high DA site, but if you can mix in the #RCS aspect and match the type group to the business sponsor, it is even better and more relevant. Also, thanks for linking to the RCS video. That was an awesome presentation. Hey Greg, thanks for that first-hand wisdom! Its kinda simple, if you are only getting the link b/c of the link value that is barely the value. Meetups are a group of people, who share a common love of a topic that you might be able to be a part of. The link is the smallest value, the greatest is the ability to talk with people who become supporters of you, your brand, your products, etc. They can give you feedback on what they like, what doesn’t etc. Wil, thanks for stopping by! It’s great to hear from the Don of RCS himself. And I agree about how the link itself is icing on the cake. Heck of a tip Phil. Best linkbuilding tip I’ve seen given out in the past 2 years. Hey Joshua, that’s great to hear. Thanks! GREAT tip, and I just got a reply from my first inquiry – thanks! That’s great to hear, Scott! 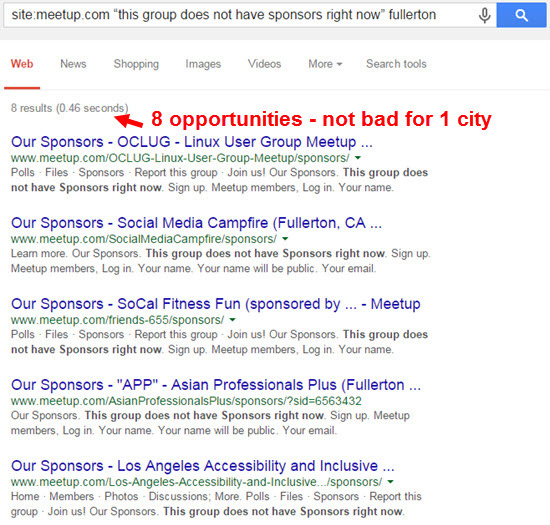 this is a great tip as most groups I see on Meetup have no sponsors. I will jump on this one immediately. It’s great to see some big names in Local SEO on this thread as well. Cheers.